Look for the size of stamp you need in the list below. Links are given for each of our 3 major brands in case you have a preference. The images shown below are for reference only and are only meant to give you an idea of what you can do. All of the stamps in the list can be customized for your particular application. If you know the make and model of rubber stamp that you need, use our search bar at the top to quickly find it. 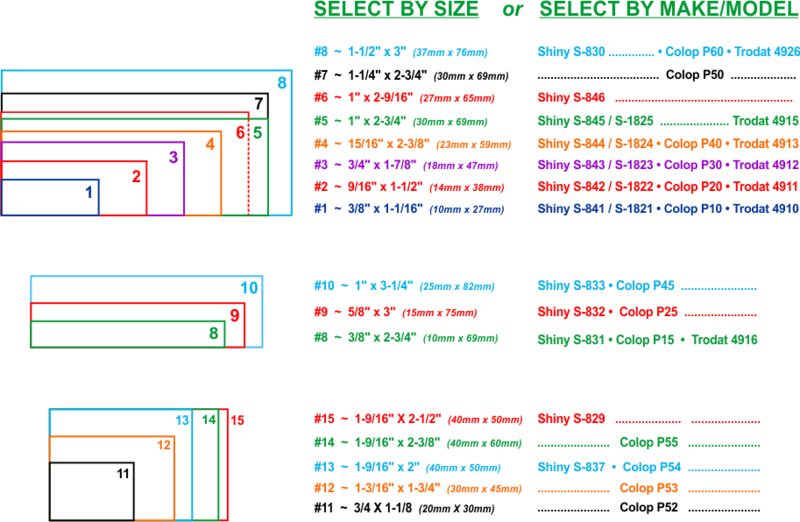 Dimensions shown on screen are for reference only – images are not to scale. Self inking rubber stamps are the most popular style in use today. You can have them personalized and custom made with virtually anything you like. Custom made self inking rubber stamps can have a signature, return address or even your company logo put on them. Because of this versatility and wide selection of sizes, the applications are almost endless. You’ll find them in the engineering office, the warehouse, everywhere! All self inking rubber stamps have an ink pad built right in to them. When you push down on the top of the self inking stamp, the die plate (where your information is) flips around to come in contact with the paper. When you release the rubber stamp, the plate turns back over and comes to rest against the ink pad, ready and inked for the next use. They are clean, reliable and come in a wide variety of sizes and shapes to accommodate every use. At T.S.T. Rubber Stamp we use only top quality self inking rubber stamps from Shiny®, Colop® 2000 Plus® and Trodat®. They are very versatile and fully re-inkable. These strong self inking rubber stamps need never be thrown out. If the image gets light, just change the ink pad or re-ink it. If the information on it becomes outdated, it can be RECYCLED by just changing the dieplate and the inkpad. No need to send them to the landfill. See our F.A.Q. page for valuable information. You’ll be glad you did!